SPELLBOUND: Calcium Titanium Borosilicate, Ethylhexyl Palmitate, Mica, Zinc Stearate, Silica, Tin Oxide, Phenoxyethanol, Dimethicone, Caprylyl Glycol, Ethylhexylglycerin, Hexylene Glycol. May Contain/Peut Contenir (±): CI 77891 (Titanium Dioxide), CI 77491, CI 77492, CI 77499 (Iron Oxides). 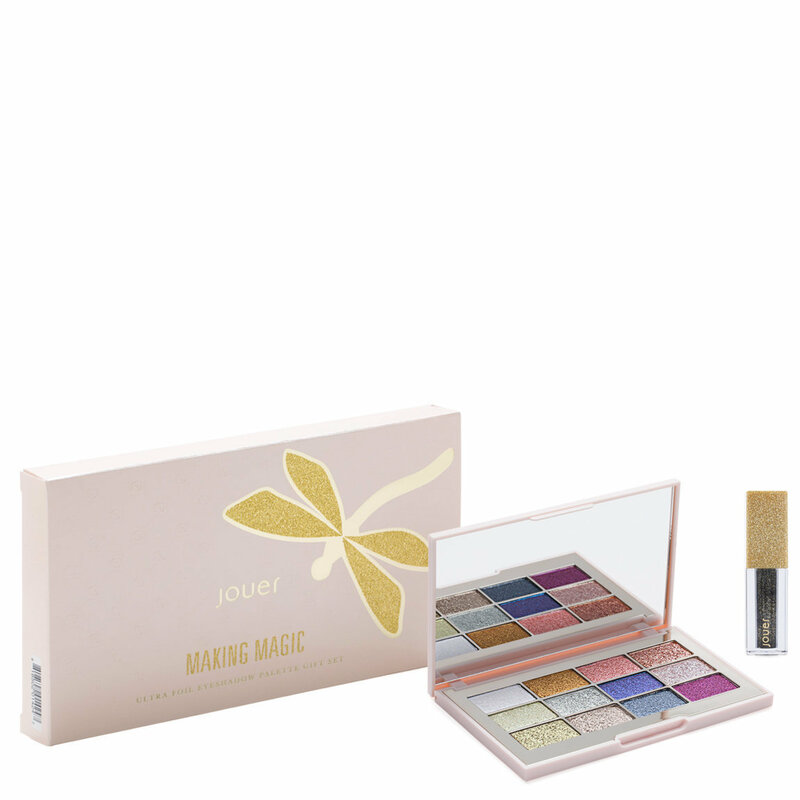 Add dazzling sparkle to any eye look with the Making Magic Gift Set from Jouer Cosmetics. This two-piece holiday collection set features the highly pigmented, 12-shade Ultra Foil Eyeshadow Palette and a shimmery, long-wearing Eye Topper. The highly pigmented Ultra Foil Eyeshadow Palette gives a high shine reflects for an ultra foiled effect. The Eye Topper dries down to a comfortable finish, locking in high shine glitter & pearl pigments for long-wear shimmer. It is infused with squalane, a 100% plant-derived substance, that helps prevent hydration loss. Apply eyeshadow with a shadow brush, blending into lids, creases, and browbone. Apply Eye Topper to bare eyelid for added shimmer or gently sweep over eyeshadow for an enhanced, glittery finish. I love Jouer’s ultra Foil eyeshadow formula! The metallic shades are so smooth and highly pigmented. I wish there was a deep black in the palette but otherwise I would recommend.